Are you new to networking? Have you ever driven to a chamber of commerce networking social only to drive away without ever entering the building? Are you confused about what to say about your company and what to ask people you meet? Would you like to have a formula for creating interesting conversation? If you answered “yes” to any of these questions, this workshop is for you! Networking is an essential business tool to today’s professionals regardless of what they do for a living. Strong business relationships are formed face to face. Target Audience: This program is written for the beginning networker who wants to maximize the time they spend networking. Format: This workshop consists of a 90-minute interactive lecture, 20-minute networking practice session, and a 10-minute question-and-answer session. Networking Made Easy contains these topics. You’ll come away from this power-packed segment with an effective 60-second commercial that will leave your networking contacts wanting to know more about your business. No effective networker should be without these seven essentials. You’ll even learn the secret to building a strong business referral network and getting more referrals than you every thought possible. Do you ever wonder what to say to people you just met? This segment gives you the formula for leading dialogue that will help you gather important details about your networking contacts while showing them how interested you are in them. We’ll also discuss methods for handling that embarrassing occasion when you forget someone’s name, giving recommendations and referrals, and identifying which topics to avoid when networking. Not every formal networking function is right for you and your business. Learn how to turn everyday activities into networking opportunities. We will also cover how to get the most out of every networking activity. Networking functions can be so scary! Never fear; this segment addresses effective ways to handle the knowns and unknowns of networking events. These eight truths and survival tips will give you the tools to navigate all the uncomfortable feelings and situations with style and grace. This program is supported by a book called Networking Zone: The Business Referral Network Construction Guide (click here for more information). 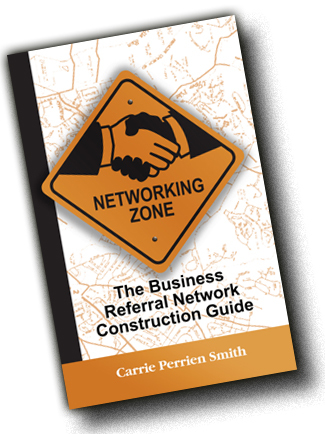 An audio CD titled Networking Zone: Business Referral Network Construction Strategies recorded at one of Carrie’s live programs will be available soon.